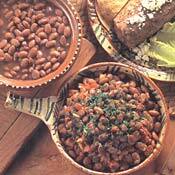 RECIPE TITLE "Beans with Tequila"
Fom Monterrey, Nuevo Leon, this is the traditional frijoles borrachos or drunken beans. It's usually made with beer and pork, but we've omitted the pork and substituted tequila for the beer. Epazote, a pungent herb with a strong flavor, is also used. You can find it at a specialty Mexican food market. Traditionally frijoles borrachos (drunken beans) are made with beer and pieces of pork and bacon. In this recipe from Juan Manuel Vivanco from Monterrey, Nuevo Leon, tequila is used instead of beer, and the pork has been omitted. The tequila is added twice during the last stage of cooking and again just before serving, to intensify the flavor. In a large covered pot, simmer the beans with the water and 1 tablespoon of lard for about 2 hours until soft; add 1 tablespoon of salt and the epazote after the first hour. Drain the beans, reserving 1 cup of the broth. Heat the remaining 2 tablespoons of lard in a cazuela or large pot over high heat until it starts to smoke. Add the onion, tomatoes, chiles, and a little salt to taste. Cook until the fat rises to the surface and the vegetables are soft, about 10 minutes. Add the beans and cook for 5 minutes, stirring constantly. Add the reserved broth and half the tequila. Continue cooking until almost all the liquid has evaporated. When ready to serve, remove from the heat, add the remaining tequila, and sprinkle the cilantro over the top. Recipe reprinted by permission of Weldon Russell. All rights reserved. Among the world's great cuisines, the foods of Mexico stand out in their diversity and creativity. Rooted in its history of great and ancient Indian civilizations, inspired by the Spanish Conquistadores of the sixteenth century, and influenced by European tastes in the later revolutionary years, it is indeed a dynamic cuisine -- adaptable but remarkably complete even in its melding of different cultures. In The Best of Mexico, food editor Evie Righter has chosen the finest examples of culinary creativity from this intriguing and vibrant country. From the chiles, chocolate, nuts, and tomatoes puréed into exquisite sauces, to the corn, beans, avocados, and seafood combined into flavorful dishes, she presents the Mexican cook's ingredients and techniques in a clear and accessible style that will enlighten and inspire. Here are the favorite drinks, salsas, and tacos; festive dishes including enchiladas, tamales, and pozoles; elegant entréeslike Mole Poblano de Guajolote and Pescado a la Veracruzana, and well-loved desserts like Flan and Buñuelos. Nobody knows Tex-Mex like Houstonian Robb Walsh, who has spent much of his career researching the vibrant Mexican-American-and-Texan kitchen. 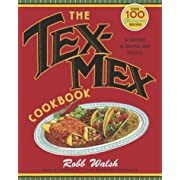 Now he shares all the savory details in a comprehensive Tex-Mex bible, filled with outsize characters, fascinating stories, rare archival photographs, and of course great recipes for making an easy-to-elegant range of classic and nuevo dishes. The Tex-Mex Cookbook takes readers from the Spanish missions of the eighteenth century to the nineteenth century’s short-lived Republic of Texas and beyond, capturing the flavor of old San Antonio’s Chile Queens as well as the distinctively homespun inventions of rural border towns in lively prose and historic photographs. From the birth of corn chip mania to the booming Tex-Mex aisles in supermarkets across America, The Tex-Mex Cookbook reveals how "America's oldest regional cuisine" became a nationwide passion. Recipes include tacos, enchiladas, and authentic Texas chili, as well as fajitas, nachos, and Frito pie. Upscale contemporary selections such as Wild Mushroom Chalupas and Prickly Pear Margaritas bring this western saga up-to-the-minute. The Essential Cuisines of Mexico: Revised and updated throughout, with more than 30 new recipes. Can it be 30 years since Diana Kennedy's first cookbook was published? Since then, and due largely to her, Americans have learned that Mexican food isn't just burritos and combination plates, but a subtle, highly developed repertoire with roots in European as well as native Mexican cooking. 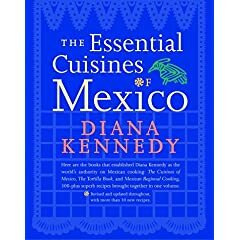 The Essential Cuisines of Mexico combines in one book Kennedy's first three works, The Cuisines of Mexico, The Tortilla Book, and Mexican Regional Cooking. 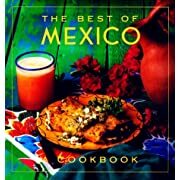 Updated and revised, and with 30 new recipes to make more than 300 in all, the compilation is instantly the definitive English-language exploration of Mexican cooking. BURSTING WITH BOLD, COMPLEX FLAVORS, Mexican cooking has the kind of gusto we want in food today. Until now, American home cooks have had few authorities to translate the heart of this world-class cuisine to everyday cooking. 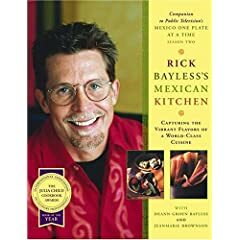 In this book of more than 150 recipes, award-winning chef, author and teacher Rick bayless provides the inspiration and guidance that home cooks have needed. With a blend of passion, patience, clarity and humor, he unerringly finds his way into the very soul of Mexican cuisine, from essential recipes and explorations of Mexico's many chiles to quick-to-prepare everyday dishes and pull-out-the-stops celebration fare. Bayless begins the journey by introducing us to the building blocks of Mexican cooking. With infectious enthusiasm and an entertaining voice, he outlines 16 essential preparations-deeply flavored tomato sauces and tangy tomatillo salsas, rich chile pastes and indispensable handmade tortillas. Fascinating cultural background and practical cooking tips help readers to understand these preparations and make them their own. Each recipe explains which steps can be completed in advance to make final preparation easier, and each provides a list of the dishes in later chapters that are built around these basics. And with each essential recipe, Bayless includes several "Simple Ideas from My American Home"-quick, familiar recipes with innovative Mexican accents, such as Baked Ham with Yucatecan Flavors, Spicy Chicken Salad, Ancho-Broiled Salmon and Very, Very Good Chili. Throughout, the intrepid Bayless brings chiles into focus, revealing that Mexican cooks use these pods for flavor, richness, color and, yes, sometimes for heat. He details the simple techniques for getting the best out of every chile-from the rich, smoky chipotle to the incendiary but fruity habanero. Then, in more than 135 recipes that follow, Bayless guides us through a wide range of richly flavored regional Mexican dishes, combining down-home appeal and convivial informality with simple culinary elegance. It's all here: starters like Classic Seviche Tostadas or Chorizo-Stuffed Ancho Chiles; soups like Slow-Simmered Fava Bean Soup or Rustic Ranch-Style Soup; casual tortilla-based preparations like Achiote-Roasted Pork Tacos or Street-Style Red Chile Enchiladas; vegetable delights like Smoky Braised Mexican Pumpkin, or Green Poblano Rice; even a whole chapter on classic fiesta food (from Oaxacan Black Mole with Braised Chicken, Smoky Peanut Mole with Grilled Quail and Great Big Tamal Roll with Chard with the incomparable Juchitan-Style Black Bean Tamales); and ending with a selection of luscious desserts like Modern Mexican Chocolate Flan with KahIua and Yucatecan-Style Fresh Coconut Pie. To quickly expand your Mexican repertoire even further, each of these recipes is accompanied by suggestions for variations and improvisations.